Start the weekend off right with Keystone Resort’s Friday Afternoon Club. 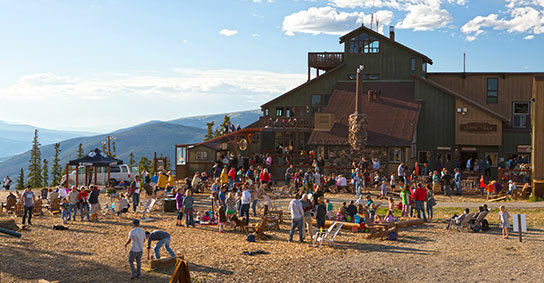 Head to the Summit House to enjoy an evening of live music, drink and food specials and activities including horseshoes, corn hole, ladder ball, bocce ball and more! Free live music will feature a variety of bands throughout the summer. All activities are free and can be checked out through the Overlook Grill. Keystone’s Friday Afternoon Club is accessible via a scenic ride on the River Run Gondola. A foot passenger ticket or lift ticket is required to access the Gondola. Foot passenger tickets are available at the River Run Ticket Office and are FREE on Fridays from 1pm-close. Call 800-354-4386 for more information. Hours of Operation: 1:00pm – 7:00pm. Weather dependent. 1:00pm – 2:00pm: Free Kidtopia Yard Activities which includes horseshoes, corn hole, ladderball, bocce ball, and more! Join us at the Overlook Grill located on the Summit House deck for an elevated dining experience. Featuring our house made BBQ, gourmet sandwiches and grilled specialties all made to order at 11,640’! Ticket Information: Foot passenger tickets are available at the River Run Ticket Office and are FREE on Fridays from 1pm-close. Call 800-354-4386 for more information. Accessibility: Keystone’s Friday Afternoon Club is accessible via a FREE scenic ride on the River Run Gondola.